OK Enchanted Seashells, here they are. 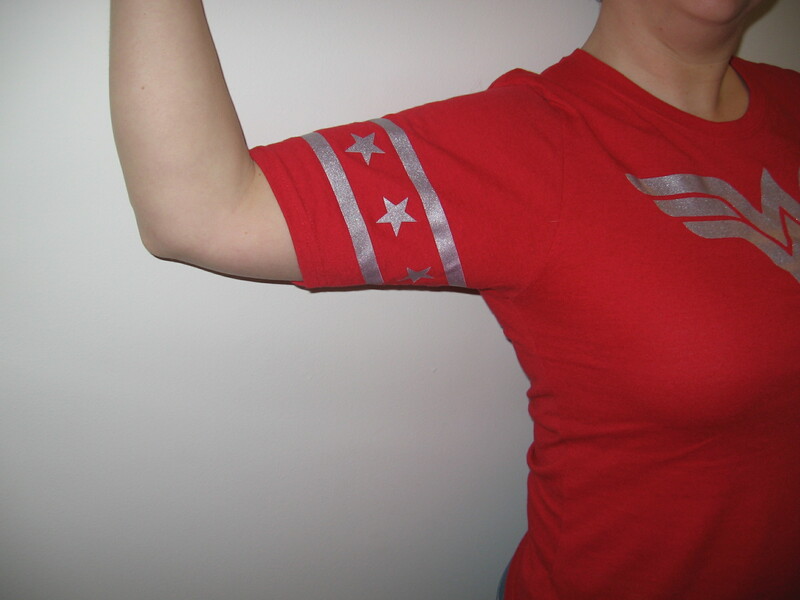 I love my new Wonder Woman t-shirt but it hides the “Guns”! 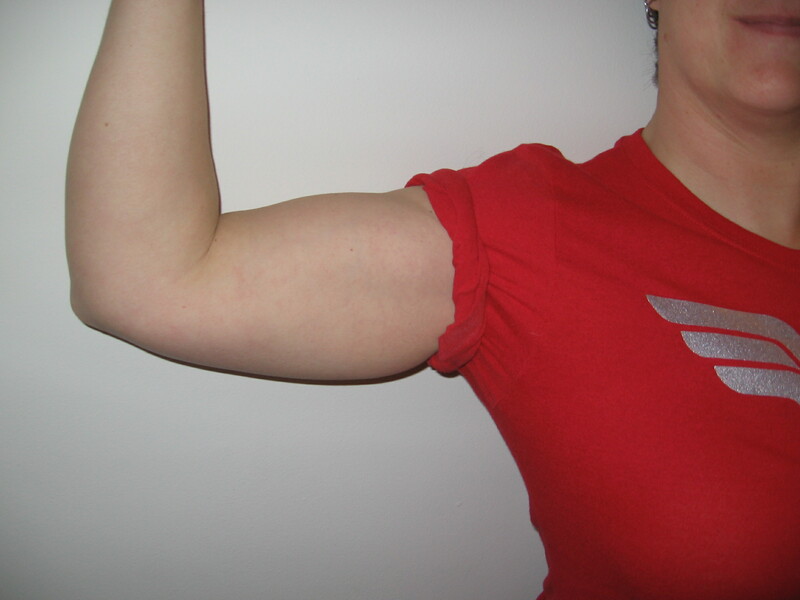 Getting muscle definition of biceps, triceps, and forearms. Hard work paying off. It should be noted that when I was at a pretty low point, not being able to look myself in the eyes let alone see my whole self in the mirror, I would look at my arms. I noticed “the cut” and was pretty impressed when it started forming. 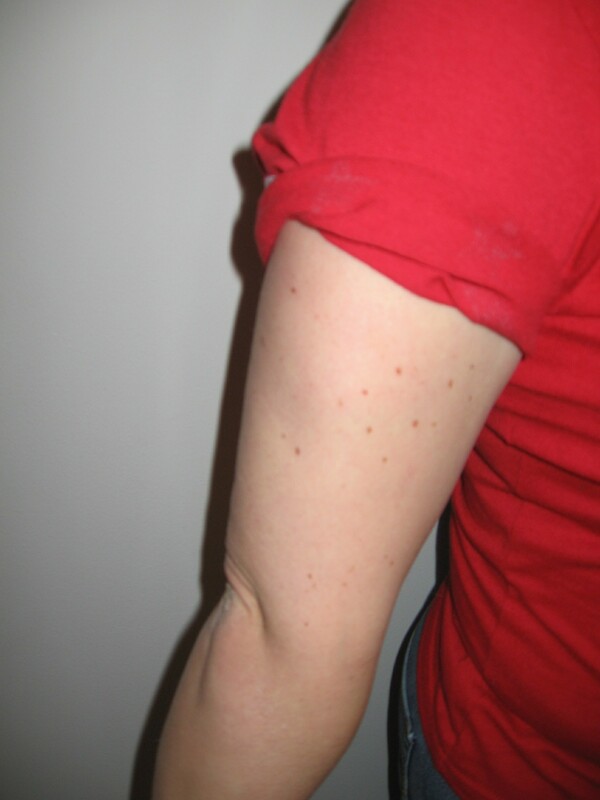 (“The Cut” is the definition of the arm muscles that shows when flexing or when in a semi-relaxed position.) But I also started seeing imperfections under certain lights. It seemed odd because I used to wear tanks all the time so why was it bothering me now? If I was ever at risk of developing body-dysmorphia, it was at this time. Ugly fluorescent lights seems to make the dimpling imperfections stand out. Of all the things to fixate on and I chose my arms. I stopped wearing tanks and had a hard time convincing myself to buy a sleeveless dress. If you’ve stopped by before you’ll note that my little black dress is sleeveless but I wear it under a jacket. I know in my head it is the lighting but it is hard to get past. I let the Chief take these. This is my newest Wonder Woman t-shirt. I bought it for a special occasion (but I’ll share more about that when I can!). So an Army chaplain acquaintance of mine posed a question I too have been wondering. Thanks to Dictionary.com I have the definitions in question. But sadly, no answers. 1. to fail to agree; differ: The conclusions disagree with the facts. The theories disagree in their basic premises. 2. to differ in opinion; dissent: Three of the judges disagreed with the verdict. 3. to quarrel: They disagreed violently and parted company. 4. to cause physical discomfort or ill effect (usually followed by with ): The oysters disagreed with her. Cold weather disagrees with me. OK, but can anyone tell me if they see the word hate in either definition? I think hate is one of those overused and incorrectly used words thrown out there like love, fair and fairness, bragging, rights, entitlements. What is the inconceivable phrase from Princess Bride? “I do not think it means what you think it means.” We are so quick to say “I hate oysters because they disagree with my stomach.” Really? You hate them? Isn’t that extreme? Perhaps this is yet another example the ravages of time on the English language as we become stupider and more dependent on technology. We have no idea what we’re saying but we’ll sure throw out words if they harm, inflicts damage, and batter anyone not in agreement with us to suit our own purposes. So what is the definition of hate? Synonyms 1. loathe, execrate; despise. Hate, abhor, detest, abominate imply feeling intense dislike or aversion toward something. Hate the simple and general word, suggests passionate dislike and a feeling of enmity: to hate autocracy. Abhor expresses a deep-rooted horror and a sense of repugnance or complete rejection: to abhor cruelty; Nature abhors a vacuum. Detest implies intense, even vehement, dislike and antipathy, besides a sense of disdain: to detest a combination of ignorance and arrogance. Abominate expresses a strong feeling of disgust and repulsion toward something thought of as unworthy, unlucky, or the like: to abominate treachery. I’m not sure I read neither disagree nor quarrel in that definition or list of synonyms. One might say, especially in the case of quarrel definition #1, that hateful things can occur to cause a break in the relationship but quarrelling itself doesn’t appear to be synonymous with hate. Or am I just missing it? Without social media I am not sure I’d be picking up the phone trying to contact people to give them my condolences. First of all, I doubt I’d have the phone numbers. Besides, I hate the telephone. But social media causes all kinds of social etiquette questions and new situations. Think about how people are having to send “Sorry but you’re not invited” announcements for weddings and parties that are public knowledge because of social media. For example, I have one friend who announced in church that a family member passed but did not mention it on FB. Mutual friends started posting condolences. What if the person didn’t want it to be so public? People certainly would not want to cause additional pain intentionally. Someone else who had a baby did not want information about said baby on FB due to the nature of her job. My heart is still aching for my friend and the loss of her daughter. It was right there on FB. Eventually when the grandmother said something, I sent my condolences to her as well. Here’s the deal and dilemma: this family is large and has several ex’s in several generations but all the children seem to still communicate. This loss will surely be felt by most. But I’ve hesitated sending condolences to those in the family I know mutually (and am FB friends with) because I don’t know if they know for one thing. Obviously I would not plaster their page with “I’m sorry for your loss” if they haven’t said anything but I still hesitate to send a private note. Because, second, while children may still have relationships that is no guarantee ex’s do or that they keep in touch with ex-steps. No one needs extra drama at this time of such tragic loss. Certainly, social media has its merits for being able to reach out at a time of loss–or joy–but the etiquette rules are so blurry. I think it would be safe to say one should “mind their own business” and just be there for the friend when the service is announced. Social media makes everything everyone’s business. While it can be the fastest way to get the word out and stay connected, it can be the fastest way to get the word out… if you know what I mean. Just thoughts I’m pondering as I just wish I could do or say something more than I’m so sorry. My prayers for this family have been unending. The other thought I keep thinking about is how we always tend to say all the wrong things and often the person suffering the loss ends up feeling like they have to comfort everyone else! I posted a quip about “hug your children no matter how old they are. we are not guaranteed tomorrow.” So many started asking me what was wrong. I did say an old friend lost a child too soon … much the same way I blogged on here. But it generated “Oh I’m so sorry” as if it was my loss. Certainly many said they would pray for this family and I think that is a wonderful bonus of social media. They certainly need our prayers. But it wasn’t about me. I don’t need comforting–I found myself making sure I was saying my heart aches for her–because it is not my heart breaking for the loss of a child. I just wanted, out of that ache, to remind people to cherish their loved ones. Life is just too short. E.o.t.T. will never be the same! Things are going good at the trainer. Unless you count that the trainer is now starting to give punishment runs to the 9ish Crew for showing up late. The 9ish Crew is the group of us that he tells to come in staggered between 9 and 9:30. So many of us have been coming in at 9:30 that the staggering isn’t working like it should. I’m actually enjoying having the workout partners. Two are actually partners and do relatively the same workouts. One is the powerlifting grandma who really inspires me. Occasionally a lone guy and his county sheriff wife join us on their days off. But yes, if you push “9ish” back by a whole half an hour, you will get punishment runs or prowler circuits. Trust me. I know. And it didn’t matter that it was my birthday. Yup, I got a SIXTH prowler circuit on my birthday. I’m lucky I didn’t hurl. 6 overhead presses with a 45 lb. bar, 30 seconds step-up (just graduated to an 8 inch step, 15 hip hop ups, 8 medicine ball smash downs 20 lbs., push the prowler with 20 lbs, low bars up, high bars back the distance of the room (25 feet?). We took out hand-walks because of the bench press. My bench press was pretty good yesterday. One thing is I did not know the goal weight so I wasn’t so focused on that. I looked afterwards and it was 125 lbs. My PBR is 130 but I assume we’ll be going for 135 soon and that will be roughly 80% of my body weight. So why will E.o.t.T. never be the same? Not because of the punishment runs (although yesterday the last person to stroll in got them!). No. It is all because of The Big Bang Theory. The Chief and I caught an old episode the other night … here. Watch. You’ll see what I’m talking about! The Big Bang Theory Season 3 episode 4. You are currently browsing the snipewife blog archives for March, 2013.